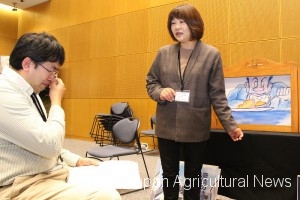 FUKUSHIMA/MIYAGI, March 9 – Eight years have passed since the March 2011 earthquake and tsunami, and women engaging in agriculture in the disaster-hit Tohoku region are trying to hand down their experiences to future generations to raise awareness toward disaster prevention. Yoko Oka (right) performs a kamishibai storytelling at an event in the city of Fukushima. Yoko Oka, 58, who evacuated to the city of Fukushima from Namie, Fukushima Prefecture, following the Fukushima No. 1 nuclear plant accident, tells her stories as a disaster victim using kamishibai paper picture boards. Her storytelling spread through word of mouth and now she travels nationwide half the month. She even performed in France in March 2017. “It is my role to convey the grief of being driven away from home,” Oka says. Oka, who used to grow rice and vegetables in Namie within a 10-kilometer radius of the nuclear plant, was forced to evacuate after the nuclear meltdown. After the evacuation order was partly lifted to allow residents to make short visits, she went back home, only to see her fields devastated. In 2014, when she was living in the city of Fukushima, she was introduced by a fellow farmer to a storytelling group that offers kamishibai shows at temporary housings and decided to become a member. The kamishibai story she created – titled “Remorseful” – depicts the distress of fire brigade members of Namie who had to give up rescuing people buried under the wreckage because of evacuation orders. In 2017, the evacuation order at the area where her home is located was lifted, and she is working to restore her farmland. She also renovated a storehouse at her home and opened a community café so that people who evacuated to other areas will have a place to return. “I want to continue the storytelling activities and contribute to my hometown,” she said. Mieko Matsuno (left) talks about the damages caused by tsunami to the customers of her restaurant in Minamisanriku, Miyagi Prefecture. 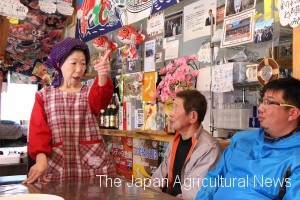 Mieko Matsuno, 65, who runs a farm-to-table restaurant in Minamisanriku, Miyagi Prefecture, tells her disaster experiences to some 400 customers a month. When a tsunami hit the region in March 2011, she was visiting her father who had been hospitalized. The four-story hospital was flooded up to the third floor. As nurses shouted to give evacuation instructions, Matsuno rushed to the rooftop, but she couldn’t save her father. She thought of becoming a storyteller in May 2011 when she was in Sendai and ran into a woman who used to live in Minamisanriku. Immediately after Matsuno said to her “I’m glad to see you safe and sound,” she burst into tears. The woman told Matsuno that she tried to escape from tsunami with her grandmother and climbed up a bank at the back of her house. Her grandmother was caught in mud water up to her chest and she could not pull her up. Listening to her story, Matsuno said she was determined to open a farm-to-table restaurant to create a place for people who evacuated to return and to convey the disaster experience and the need for disaster preparedness to people who are visiting the region for the first time. She offers meals full of vegetables she harvests and tells customers that the place was flooded by tsunami and she could not cultivate at the time. She also accepts tours for students to learn about the disaster and visits educational facilities in Tokyo to talk about her experience. “It is hard to talk, but I want to continue the activities to alert people to the danger of tsunami,” Matsuno said. This entry was posted in Food & Agriculture, Others. Bookmark the permalink.